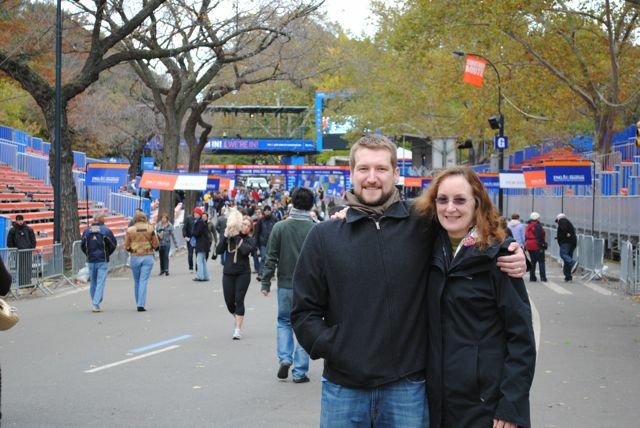 Checking out the finish line with my son-in-law the day before. Last weekend I ran in the NYC marathon with a singular goal. I was determined to run throughout. It was less important to me to achieve a particular time goal than to simply keep going until it was over. This is my fourth marathon in four years. In the other three, there has always been a point where I was reduced to walking for long periods. And, usually, when I evaluated my performance after, I realized that my head was typically the problem - telling myself that I couldn't keep running any further. So, this time, my goal was to run throughout. And, I did. I mentioned just that earlier this week in journaling for the SAQA Vision project and another artist astutely pointed out that my self-confidence in one area of life transfers to other areas. How true. The encouragement and support that I have received from people in the past year in the Vision Project has propelled me well into the realm of art quilts. There are still moments of self-doubt, but the network of participants is quick to remind that we can do anything we set our minds too. I have no doubt that my newfound self-confidence in art quilting strengthened my determination in my marathon. And, I am sure that my success in my marathon will feedback into my art. The power of the mind is amazing. Countless books have been written about overwhelming odds being overcome when someone decides upon a course of action and dedicates to it. In the mind/body workshops that I have taught with Tom Crum, we have a saying: "True power is energy flowing freely towards a vision." I have a poster in my bedroom closet where I dress to go out for a run that alludes to the same concept. It is from Olympian marathoner Deena Kastor and is signed, "Believe and Achieve." I am sure you can think of many more sayings that express the same basic truth. The important thing is, of course, that we all make the choice to live this idea. It doesn't happen unless we choose to try. Cogratulations on your achievement, Judy! When is a Quilt 'Art'?